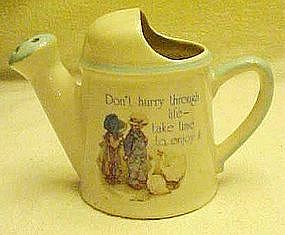 A precious watering can figurine that has actual pour holes in the spout. Sentiment reads "Don't hurry through life~ take time to enjoy it". Hollie Hobbie and a friend feeding the geese on the front. Measures 4" tall and is in perfect condition. Marked Holly Hobie, Blue girl stoneware and dated 1978.